On Saturday, February 4, the Shared Schoolyard Project hosted another public opening of a playground in our neighborhood. 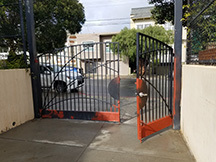 This time, it was at the Mission Education Center (Kate Kennedy Elementary School) at 30th and Noe. 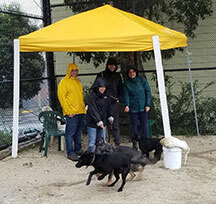 Before we could even set up, a drizzle quickly turned into showers but that did not dampen the spirit or the initiative of the organizers or the volunteers that had gathered to help promote community building. Bustling inside, a flurry of activity quickly transformed the school’s cafeteria into a showcase for local organizations and merchants. 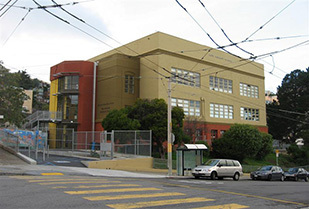 Friends of the Noe Valley Recreation Center tabled with SF Rec & Park. 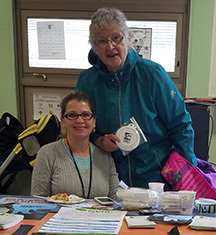 Upper Noe Facilities Coordinator Cheryl Woltjen and Friends’ Joan Lionberger are pictured here passing out info, freebies and cheerful smiles. Our nearby neighbor and newly appointed Supervisor Jeff Sheehy stopped by with his family. As sponsor of this program, Supervisor Mark Farrell was present to announce the agreement made with Principal Carla Vasquez and SF Unified to make the school’s playground available to the public on weekends. Sign ups begin at 10 a.m. on Saturday, March 4. Choose classes online at www.sfrecpark.org or at the Rec Center. Staff is ready to assist you. Browse classes in advance and add them to your Wish List. 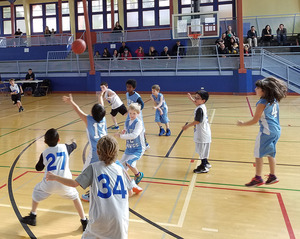 To find out more information and updates to the schedule of classes and events, call 415-970-8061, visit www.noevalleyreccenter.com, or just drop in to the Rec center office at 295 Day St., open Tuesday through Saturday. These popular classes are back for Spring Session on Wednesdays at 4:30 (4-7 yrs) and 5:30 (6-12 yrs). More than 80 camps are available to inspire your kids, everything from traditional camps like Silver Tree and Pine Lake, to exciting new fishing and adventure camps! Registration begins at 10 a.m. on Saturday, March 18. https://apm.activecommunities.com/sfrecpark/Home . Scholarships for summer day camp must be active through March 18. See the status of your scholarship at sfrecpark.org/register. Click on Account Activity, then on the List Scholarships link. If you need to apply or renew, do so prior to February 28th for approval to be processed in time. Extensive tree trimming in and around Upper Noe Rec Center happened just in time. 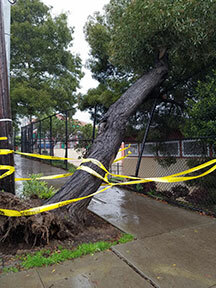 Despite severe pruning in December in anticipation of winter weather, San Francisco’s biggest storm of the season took a toll in January. Fortunately, damage was light. On the positive side, intense wind and rain has left the playground cleaner than ever. Our new gardening staff has been busy shaping up the foliage in anticipation of spring. We are grateful that gardening staff is now dedicated to our park several days a week. Upper Noe has suffered through labor lapses over the past several years due to staffing shortages. Already, the results are striking, and especially noticeable along Day Street and Sanchez Street. Take a stroll and check out the park. While the weather has foiled Rec & Park painters from big outside jobs elsewhere, they are using time wisely to touch up around the grounds at Upper Noe. Thanks! We appreciate the conscientious manner at which the work is proceeding. You might have noticed red primer upon the exterior gates, playground equipment and such. Bit by bit, we should be looking good by summer. Thanks for your interest and support of your park! Please email info@noevalleyreccenter.com with any questions or suggestions. Let us know about any community events you are planning at the park so we can promote them.